He can now join some of the greats who finished their rugby league careers with a grand final triumph. The Daily Telegraph can reveal that South Sydney and star winger Lote Tuqiri have parted ways. Tuqiri’s final match of rugby league was South Sydney’s famous and historic grand final win over Canterbury last month. Other rugby league champions to finish their careers with NRL premierships included Ray Price, Mick Cronin, Royce Simmons, Glenn Lazarus, Norm Provan and Mal Meninga. Tuqiri was outstanding in the Rabbitohs’ grand final charge, his experience invaluable during September’s semifinals but it is understood Souths and Tuqiri haven’t held any contract talks since the grand final. At 35 years old, Souths privately feel Tuqiri would struggle to finish another gruelling season of NRL. The former Wallaby didn’t travel to Arizona for the club’s high-altitude training camp but understandably, given Tuqiri was always well-liked and highly marketable, there were whispers on Wednesday that he may have a final season of rugby union in Japan. However it is unlikely he will play top-level rugby league again. The 35-year-old Tuqiri rolled back the years in 2014, particularly with this try against Manly. 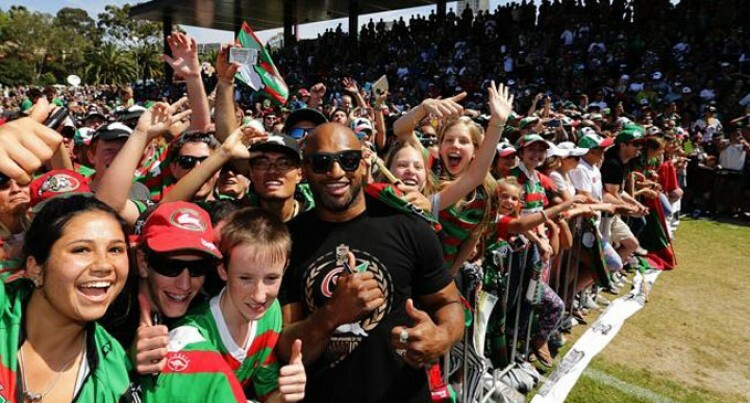 In the euphoria of Souths title win, Tuqiri vowed to play-on in 2015.